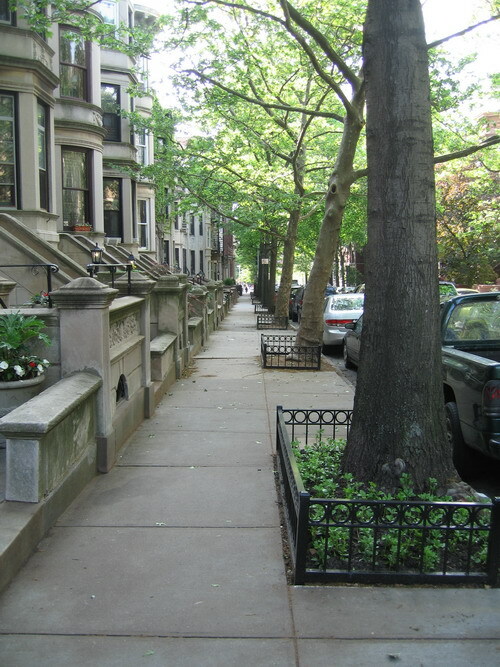 Workers have been toiling at installing these tree guards in Park Slope this spring, particularly along Prospect Park West, Eighth Avenue and, recently, Fifth and Sixth Streets. We don't know how many have been installed, or will be, but you'll know they're coming to a tree near you by the square boxes painted on the sidewalk around the trees long before the work is done. Some people are taking advantage of the new space around trees by doing mini-landscaping and planting. The one negative we'll note is that they take up an awful lot of sidewalk space, but we're sure that both the trees and the sidewalks will do better with them in place. Money for the tree guards comes through the Borough President's office.